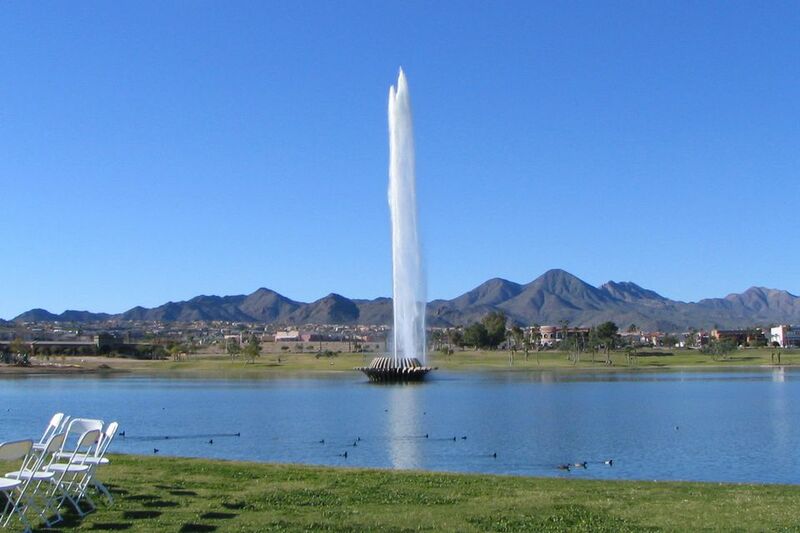 Fountain Hills just wouldn't be fountain hills without—The Fountain! The Fountain was once listed in Guinness World Records as the tallest fountain in the world, although that listing doesn't exist anymore and there are some taller fountains now. Still, it is a fantastic sight that can be enjoyed from miles around, and probably the most popular attraction in Fountain Hills. The Fountain runs on schedule and spurts a column of water for 15 minutes every hour on the hour between 9 a.m. and 9 p.m., seven days per week. If winds are high, or if maintenance is required, the fountain may not be operating, but that's an exception to the schedule. There is no admission charge for Fountain Park. Seeing The Fountain is a popular free activity in the area. The Fountain has been operational since 1970. When the fountain is operating, it has a column of water that can reach 562 feet in height. The Fountain is set in the middle of a 30-acre lake at Fountain Park. On windy days, the fountain may not be operating. If the wind reaches 10 MPH, the Fountain automatically turns itself off. On most days, the water from the Fountain only reaches a height of about 330 feet. That's because there are three pumps operating the Fountain. Usually, only two are in use, with one of them being a backup. When all three pumps are operating together, water stream can get as high as 560 feet. The full height is run on just a few days of the year: St. Patrick's Day, Fourth of July, and on December 5 (Fountain Hills Anniversary of Incorporation). You won't hear the fountain when it is working—it's very quiet! Once a year, on St. Patrick's Day, the Town of Fountain Hills adds color—green, of course—to the water. If you attend the Fountain Festival of Arts and Crafts, you are likely to see The Fountain. Be sure to review directions and a map to Fountain Park to help you plan your trip. If you are driving from other parts of the Valley of the Sun, you can check to see how long it should take you to drive. This location is NOT accessible by Valley Metro Rail.